The Pledge Total of our extra funding campaign is now over $170K CAD. The Caprice Ammon Mount stretch goal is now unlocked and we'll be adding 1 to all the Core Starter Sets. 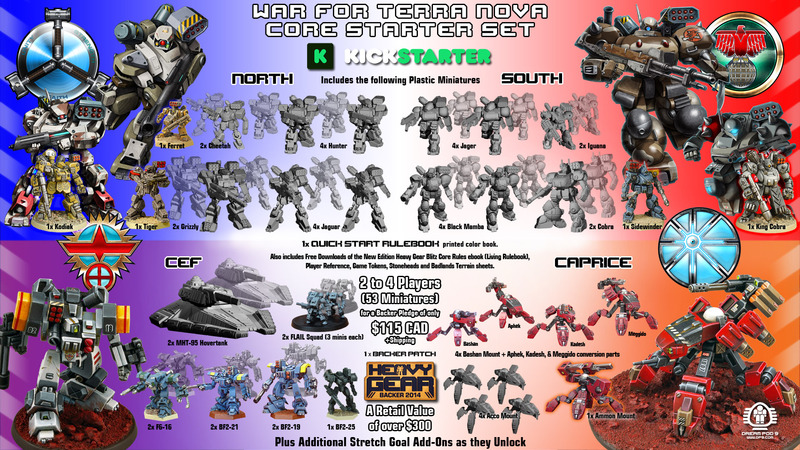 This brings the number of miniatures included in the War for Terra Nova - Core Starter Set up to 53. We have also added the Ammon to the Pledge Manager Add-Ons Available section at $14 extra pledge each for Backers who want a second or third one for their Heavy Mounts squads or as a Support Unit. For the Extra Weapons and Parts Sprue that was not unlocked during the extra funding campaign, we'll make sure that all the extra weapons and parts are made available for purchase in pewter on the Online Store. Here is a direct link for new Backers to get on board and setup an account on the War for Terra Nova Pledge Manager.